Finnish bass Mika Kares is not only making his Seattle Opera debut as Attila on January 22, he’s also making his American debut following several years performing primarily in Germany. We recently chatted with Kares about the opera scene in Finland, how Seattle compares to his homeland, and what direction his promising career is taking now that he’s traveling the world and taking on heftier roles. Welcome to Seattle Opera! This is your company debut, so can you tell us where you’re from and how you began in opera? I’m from Finland, which is far away from Seattle! It was a long way to get here, but it’s nice to be here; this is actually my American debut. I’ve been mainly singing in Europe. I sang in Germany for five years and now I’ve been traveling for roles. I sing in Spain, France, and even in China. I hope, now, I can sing more frequently in North America. I would love to be here more. I started singing when I was 22, so I started late. I was an actor before I started to sing; I started acting when I was 15. All of a sudden I was on stage, and no one could get me off! After one show, I was singing in the shower and another actor overheard and said, “You know, you have a voice.” And I said, “OK…” and then he said, “You should get some lessons,” and I thought, “Well, why not?” So I tried, and everything went pretty fast after that. After four years of studying I was already in Germany working. 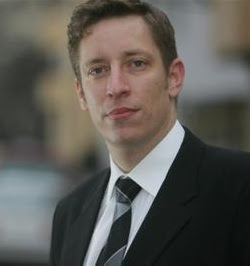 I worked there for five years and now I have done this work as a freelancer for three years. So it all started pretty fast. What is the opera scene like in Finland? Well, we only have one opera house, the National Opera in Helsinki, and we have one big festival, in Savonlinna, so we don’t have too many singers but the ones we have are of good quality. We have some big stars who are giving us youngsters an example of how to do this work. So it’s nice, and we have a good spirit. 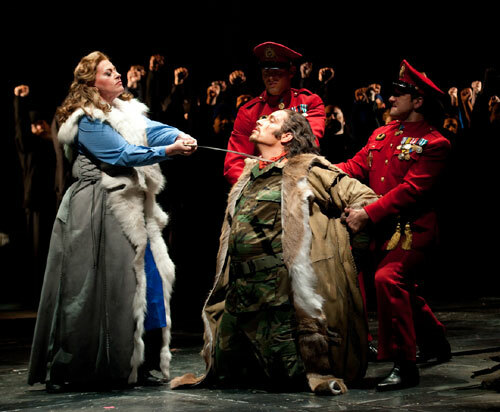 We have Finnish operas, too, and Finnish National Opera does maybe one or two per year. 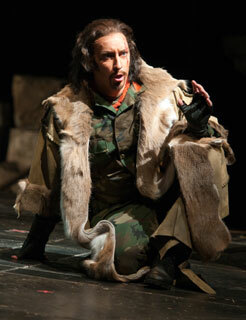 Mika Kares as Attila in Seattle Opera's production of Attila. Is the Finnish language a difficult one for singers? Well, if you don’t know it already, it’s a really difficult language. In a way it’s pretty close to Russian, so if you know that, it can help a bit. But for me, it’s my mother tongue and I can really get to those special colors. It’s always so painful when I’m singing Italian or something, and I just want to get specific colors, and then I see an Italian singer do it amazingly. Do you still make your home in Finland? At the moment I have an apartment in Helsinki but I’m travelling a lot. This season, I’m spending nine months away from Finland, so I only sort of live in Finland. I pay my taxes to Finland! But that’s normal for an artist. This is your American debut, but have you ever visited the United States before? Actually, this is my first time in America. I’ve never been here, never even for a holiday. I’m a little bit surprised by Seattle; it has so many Scandinavian roots, and it shows! People are really friendly here, and the weather is pretty much the same as it is in Finland. It’s different, but not as different as I expected. Have you had any experience with Attila prior to this production? No, this is my role debut. Before this, I’d not even seen a performance. I’ve only seen the DVD, the famous Samuel Ramey one. But I’ve been singing Attila’s aria for a long time already, it’s a really great aria for a bass. It’s sort of bass-baritone, but you also have to give it this dark sound, too. What’s also interesting is I went through the whole history of Attila, and every history book says he was a small man, but John Relyea and I are both big—I think I’m 6’5” or something; in Europe I’d say I’m 196 centimeters. Do you have a favorite moment in Attila? Attila’s big aria is great but I just love right after that, when the bishop arrives and Attila is thinking, “Is this a dream, is this reality?” The music is so beautiful, and Attila is oddly fragile, and then strong again, and then fragile. I really like that. Do you ever feel limited in the kind of roles you can take on as a bass? Are there any roles you dream of one day doing? That’s a tough one, but I would love to do Don Giovanni once in my life. It’s not so often done with a bass, but it could be done with a bass, and I would love to do that. And also Scarpia in Tosca. Most of the time, though, I’m just “King.” I was looking through my calendar recently and it was like, OK, last year I was the kings of Scotland and Egypt, and now I have King of the Huns, and the King of Spain next season. So that’s pretty normal for a bass. You’re the king, a priest, or a bad guy. But I sing all kind of repertoire at the moment because I’m only 33, and everyone calls me Baby Bass. I’m getting there, I’m Teenage Bass now. So I sing lots of Wagner right now, because the celebration year is coming, in 2013. I’ve done the whole Ring like 6 times already. And I sing lots of Verdi—mostly the priest in Aida, or the King of Spain in Don Carlo, but I also sing Handel and early music. So I’m now deciding what direction to take in my career, because the next four or five years are pretty important for me. I’m jumping into the big roles and seeing what happens.